Now that the snow is beginning to melt, kids all across the U.S. are heading out for the first Little League baseball practices of the season. Little Leaguers have a lot of things to learn, like how to hit and catch and throw and the finer details of the infield fly rule. But there’s one thing that should be super-easy to learn that can even trip up major leaguers — and that’s remembering to call for a fly ball. From the time they first put on a glove, young T-ballers learn to yell “Mine!” or “I got it!” or “Ball!” when they think they can catch a pop-up. But as a general rule, baseball players don’t yell “Yours!” It isn’t anyone else’s job to tell you to catch a ball. If you think you can catch it, you go for it, unless you hear someone else calling for it, in which case certain players take priority over others. Now the one player who has precedence over all others on the field when it comes to catching fly balls is the center fielder. The middle of the outfield provides the best view of the entire baseball diamond, so the center fielder can see better than anyone else where the ball is going. In addition, it’s always easier to catch a ball if you are running in toward home plate than if you are backing up towards the fence. So if an outfielder and an infielder are both calling for the ball, the outfielder should always take it. Great, you might be thinking, now I’m in the mood for baseball. But what does this have to do with pricing? 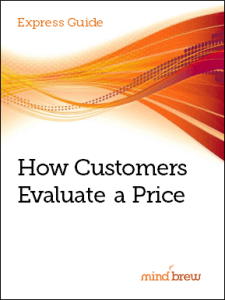 As a pricing practitioner, you often have the best visibility into the company’s data. You’re seeing all the sales data on a regular basis, so you are in the best position to reach important conclusions about that data. You are, as it were, the center fielder for the team. But far too many pricing professionals are content to stand out in the field picking daisies rather than rushing after and calling the ball. Of course, your primary job is to do what you can to assure good pricing for the company. But if you see that someone else on the team is about to drop a ball and you can get there in time, call the ball and go after it yourself. I suppose this is just an elaborate, metaphorical way of telling you to widen your scope. Worry less about staying in your lane and more about doing what’s best for the company. In our experience, those pricing teams that broaden their focus beyond pricing to profitability are truly the most effective for their organizations. If this idea intrigues you, we have a couple of resources for you to check out. There’s More to Profit Than Price talks more about this idea of redefining the pricing function and exposing other profitability levers. And Developing a Winning Roadmap for Pricing Success explains how to make a plan that helps your pricing team become more valuable and strategic over time. And now if you’ll excuse me, I’m going to go buy me some peanuts and cracker jack and root for my home team. In our research, we’ve identified ten areas where “best practices” have been redefined; setting new benchmarks for pricing excellence in B2B. Use this self-assessment to see how your capabilities measure up.